Having just read the menu that was offered in front of the class-dividing curtain the other day, this very clearly was a step down, but such is life… My seat neighbor and I both comforted ourselves with a glass of champagne from the pre-flight offers of OJ, water or bubby, and while he went on to order just a pot of instant noodles as his main course (he had tried all the dishes on offer on previous flights already… and thus dined in BKK before getting to the airport! ), I did indeed order the beef. The two flight attendants serving our aisle were okay, not especially friendly but nowhere as rude and minimalist as the ones I dealt with on the outbound flight. But also nowhere as nice as “my” angel the other day in Swiss First. We took off on time, and as we reached cruising altitude, the crew offered hot towels and another round of drinks before laying our tables with a white tablecloth that still said “Crossair” on it. The “amuse bouche” / appetizer service has gone long ago, and to my dismay I was served one large tray that contained the salad, the main course and another one of these very small cheese plates, just like the one I had gotten on all my previous LX flights in this report. The salad was not only small but also bland, so I skipped it altogether and went for the main course while it was still hot. At the first bite, the taste of it was immediately familiar as this dish very much resembled the beef I had the other day in First. Both dishes were catered out of BKK, and it became obvious that it was essentially the same stuff with just some minor differences in the sides. 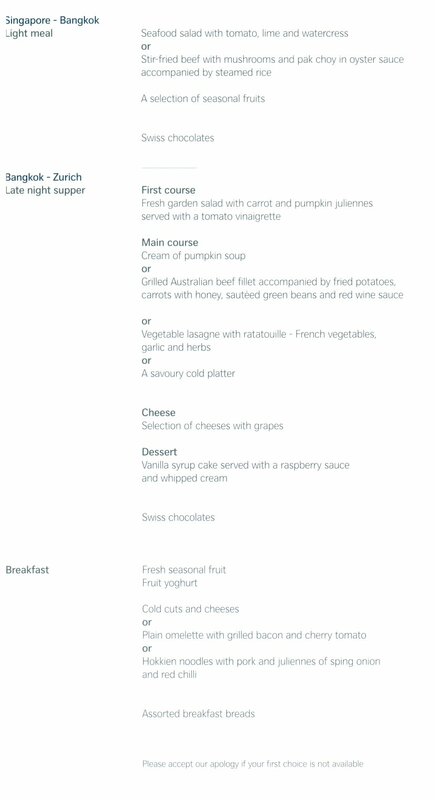 I found the dish to be okay for C, but you decide what the “food sharing” tells you about the attitude behind the LX premium cabin catering. Unlike on Cathay, the crew here had no problem to remember my choice of sparking water, and they impressed me with a very nice and savvy presentation of the available wines when I asked for a glass of red with my beef. However, with two flight attendants serving 21 C passengers, it sometimes took them a while before they refilled my water glass  which only holds about 1.5dl of liquid and is thus frequently empty. Considering that there might be a longer wait, I ordered my glass of port at the same time I got my red wine and therefore had it ready when I was ready to tackle the three small hunks of cheese (which by then at least had the right temperature). The Portuguese red wine was mediocre IMHO, but the port was okay (although nowhere as nice as the one in First) and I made a mental note that said that port should be the only Portuguese drink that makes it into my gorge. The dessert, which was served once the tray was cleared away, was nicer than it sounded and to my surprise not too sweet. I then watched a short feature on the IFE while having a cup of herbal tea and some Swiss chocolates (they’re Lindt in Business, Sprüngli in First). The flight attendants distributed half-liter bottles of water for the night, and I also noticed that they installed a “snack bar” next to the galley, just as they used to do on the MD-11. Good to see that they kept this nice touch. Extending my seat to its fully flat position after that, I was able to sleep for roughly seven hours, something I would not have thought possible due to the seat’s angle. But hey, it worked and I woke up just in time for breakfast. One thing I hate about Swiss, and they did it on every night flight I’ve been on so far, is how early they turn the lights on for the breakfast service. As usual, it was about 100 minutes out of Zurich. I didn’t mind this time as I had just woken up anyway, but if you’re on a eastbound transatlantic flight that only takes 6.5h, this can really be annoying! No hot towels were offered prior to breakfast, and regardless of whether that was another cost-cutting measure or just a case of a lazy crew, I was disappointed as such a hot towel really helps you wake up after a night on the plane. It can’t cost the world, can it? Breakfast was fine, with fresh and tasty fruit and some freshly brewed coffee. It’s not really Swiss’ mistake that the caterers in Thailand don’t know how to make tasty rolls, they were all white and soft and chewy, which I don’t like. But LX offered Swiss butter and honey with’em, which was better than the stuff they have in Siam. The yogurt was fairly substantial, and I decided to forego the hot items, which were presented on a large tray, and instead had some cold cuts. As we started our descent into Zurich, an arrival video was shown (it has now been updated to feature the new terminal) and the Maître the Cabine stopped by to welcome “two of our Gold members” on board. My seat neighbor was a bit surprised by that revelation of my member status, as I had had no reason to tell him about it before that. I smiled, and we both chatted a bit with the Maître, who agreed that it was hard for her to still provide the service she’d like to with all the cost cutting measures. There seems to be a running gag with LX pursers along the lines of “and what service item has been cut today?” Sad, sad.